A late October Sunday morning saw many boaters gather for what has become an annual social event as well as an advice session on winter mooring techniques. The sun shone on this unusually warm day, and all enjoyed the chat, the chance to catch up with others, and the BBQ brunch. 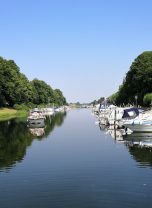 This view of the Marina ( on the right hand side) was taken as a group of our boats waited in the glorious sunshine for the lock to open, and a day in The Wash to begin. And here is one of the boats showing a good turn of speed in The Wash. 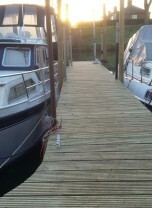 The pontoons are now nearly all renovated, and look and feel very solid. 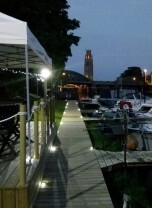 The newly renovated main walkway and gazebo area, with the famous Boston Stump as a fantastic backdrop, on a perfect summer’s evening. The winter has seen much activity at the Marina, with more improvements being made. 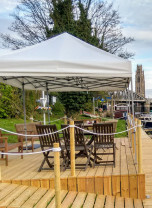 This is the newest addition, and is already proving to be a popular place where our boaters can sit and chat, whatever the weather. 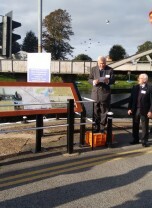 Today the Lord Lieutenant of Lincolnshire unveiled a board commemorating the opening of the Boston Grand Sluice in October 1766. It is one of only a few sluices still serving its original purpose and still in its original condition. A great feat of engineering. 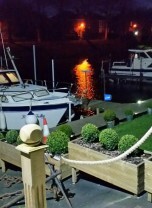 Work has continued over the winter months to improve the entrance of the marina. The floodlights, level entrance-way and ropes add to the ambience and also the safety for all customers both night and day.